Janet Reno was the seventy-fifth attorney general of the United States and the first woman ever to serve as attorney general, the nation's top law-enforcement job. She sought new frontiers for the Justice Department, which is led by the attorney general and is a powerful force for creating social change. Reno was born on July 21, 1938, in Miami, Florida. The first of four children of journalists Henry and Jane Reno, she grew up in South Dade County, Florida. Her father, a Danish immigrant, wrote for the Miami Herald for forty-three years. As a police reporter, covering news of the police department and local crime, he became friends with judges and law enforcement personnel. This world became familiar to Reno at an early age. Her mother, a reporter for the Miami News, is remembered as an offbeat intellectual who wrestled alligators, read poetry, and befriended the Seminole Indians. She built with her own hands the Reno family home on the edge of Florida's swampy Everglades region. Growing up near the Everglades, Reno developed a love of the outdoors. She was fond of canoeing, camping, and athletics. She imagined she might become a baseball player, a doctor, or a marine biologist. As an adult, however, her ambitions turned toward matters of justice and law. After graduating from high school, Reno attended Cornell University, earning a degree in chemistry in 1960. Following Cornell she enrolled at Harvard University Law School, becoming one of only sixteen women in a class of five hundred. The legal profession was full of obstacles for women in those times, and in 1962 Reno was denied a summer job at a well-known Miami law firm "because she was a woman." The next year, however, she entered the legal profession with her law degree in hand. From 1963 to 1971 Reno worked as a lawyer for two Miami law firms. In 1971 she gained political experience when she joined the staff of the Judiciary Committee of the Florida House of Representatives. In the spring of 1973 she provided legal assistance to the Florida Senate on a project to revise the state's system of rules and regulations for criminal procedures. These experiences were followed by a job as assistant state attorney for the Eleventh Judiciary Circuit of Florida. She worked for the Judiciary Circuit (the term refers to state court activities within a particular district) from 1973 to 1976. In 1978 Reno was appointed as state attorney for Dade County. This made her the first woman ever named to the position of top prosecutor for a county in Florida. Reno held the position for fifteen years until she was nominated as U.S. attorney general by President Bill Clinton (1946–) in 1993. As Dade County prosecutor, Reno was the top lawyer responsible for prosecuting and winning cases on behalf of the county and its people. She was criticized for early failures, but later her successes in prosecuting violent crimes, and her fearlessness in dealing with Miami's crime problem, helped win her a reputation as a tough prosecutor. known for her attempts to find alternatives to the imprisonment of young people. She also tried to find ways that the state could deal with troubled youth at the earliest possible age. She stressed the links between children experiencing care and love and the prevention of crime. She looked for opportunities to fight crime by building resources for children and education. On March 12, 1993, Reno was confirmed as U.S. attorney general by the U.S. Senate. In this position she saw to the enforcement of national policies on crime, race relations, immigration, corruption, and other legal issues affecting many aspects of American life. In the area of crime and law enforcement, she focused on broad programs involving efforts to help criminals reform and to provide treatment for drug offenders as a means of stopping crime. She also supported gun control and the hiring of additional police. In addition, Reno argued for broad reforms to provide ordinary citizens with greater access to the courts and justice system. She stressed the importance of addressing the root causes of crime and violence. The heart of Reno's agenda involved programs for children. As attorney general she pushed for reforms that would provide assistance to troubled youths as early as possible, believing in the possibilities for turning children away from careers in crime. Reno's other concerns included aggressive civil rights enforcement, ending discrimination (unequal treatment) based on sexual preferences, and tougher enforcement of environmental laws. The basic challenge she faced in her work involved translating these broad social goals into real and effective changes in law enforcement and the justice system. Reno's commitment was admired by many during her term as attorney general. However, she was also a controversial figure. Reno was severely criticized for the Justice Department's actions during a crisis in Waco, Texas, in 1993, when an extreme religious sect called the Branch Davidians became involved in a standoff with law enforcement officials. After negotiations between the two sides broke down, federal agents stormed the grounds and building in which the Branch Davidians were housed, and dozens of the sect's members died after setting the building on fire. Reno also became a target of Republicans in Congress who accused her of failing to investigate vigorously when members of the Clinton administration were charged with illegal practices. At the same time, some members of the Clinton administration felt that Reno was too quick to cave in to Republican demands. Although President Clinton reappointed Reno to a second term in 1996, it was reported that he did so reluctantly. In 2000 Reno again drew fire over her handling of the case of Elian Gonzalez Brotons, a six-year-old refugee who was living with relatives in Miami after his mother drowned while bringing him by boat to Florida from Cuba. After months of negotiations and efforts to resolve his case in court, Reno ordered federal agents to seize the boy from his relatives' home and return him to his father, who was living in Cuba. Many Cuban Americans, especially in Miami, were outraged by Reno's order. Despite this controversy, Reno returned to Florida with political ambitions in 2001, when her term as attorney general ended. In September 2001 she announced that she would run as a Democrat for governor of the state, but she lost in a close primary race to attorney Bill McBride on September 10, 2002. Reno suffers from Parkinson's disease, an illness that attacks the nervous system. As a highly visible and active public figure combating a severe illness, she has inspired others who live with Parkinson's and other serious diseases. Her achievements as a woman in the male-dominated legal field were also honored when she was inducted into the National Women's Hall of Fame in October 2000. Anderson, Paul. Janet Reno—Doing the Right Thing. New York: J. Riley, 1994. Meachum, Virginia. 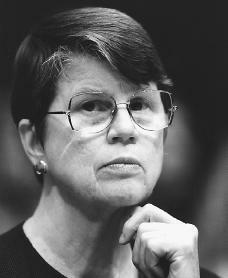 Janet Reno: United States Attorney General. Springfield, NJ: Enslow, 1995. Janet was so hot in her blue dress.She wanted the cigar that Billy Clinton used on Monica Lewinsky. Hillary had first rights, as it was her favorite flavor. Hillary fighting for us. Our country would be so lucky to have Hillary smoking Huma flavored cigars for eight years in the oval office.